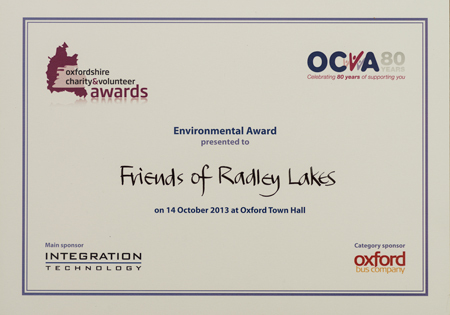 The efforts of many local people have been acknowledged by Friends of Radley Lakes winning the 2013 Oxfordshire Community and Voluntary Action (OCVA) Environmental Award. This award is given to the nominated group that is judged to have had the biggest positive impact on the local environment. The award was received, at the OVCA eighth decenary Oxfordshire Charity and Volunteer Awards event held in Oxford Town Hall on 14th October 2013, by past-Chairman, Basil Crowley; present-Chairman, Roger Thomas; Secretary, Jo Cartmell and Treasurer, Lynda Pasquire. Friends of Radley Lakes was one of three short-listed organisations, which included The Anne Carpamel Trust – which helps young people to enjoy, care and learn about the natural environment; and The Community Action Group (CAG) Project, which supports over 50 groups across Oxfordshire at the forefront of Climate Change Action. The winning organisation, Friends of Radley Lakes is a locally well-known organisation whose aims are to represent all those who value the Radley Lakes, a local area of outstanding beauty, and to raise funds for the new Visitor Centre, and to support wildlife conservation. Saving an area of Oxfordshire of ecological importance in an action that resulted in it being made a nature reserve for the enjoyment of the community for many years to come. Raising more than £80,000 from the community and continuing to raise funds for a new Visitor Centre on the site. Raising awareness in the community, the County, District, Town and ParishCouncils, Members of Parliament and the Cabinet about the importance of these lakes and the underlying issues. Raising awareness with the public and with the Environment Agency, that PFA (pulverised fuel ash) produced by coal-fired power stations is a valuable resourcethat should be recycled rather than disposed of in an environmentally damaging way. Collaborating with the Environment Agency and WRAP (Waste and Resources Action Programme) to define an environmental protocol , which has been EU approved, to permit PFA to be recycled as a by-product rather than having to be disposed of as waste. Collaborating with Earth Trust and with RWE nPower to realise a Wetlands Educational Centre at the Lakes and assisting Earth Trust in maintaining a management plan for the area. Save Radley Lakes (SRL) changed its name to Friends of Radley Lakes in 2010 after it successfully campaigned to prevent Thrupp and Bullfield Lakes in Radley from becoming waste disposal sites for fuel ash from Didcot ‘A’ Power Station. One of the more far reaching effects of the campaign resulted from the efforts SRL made in helping to draw attention to the need for changes in the regulatory frameworks surrounding UK and European waste legislation. SRL found that the legislatory and tax regimes prevailing at the time were acting to prevent waste fuel ash from being recycled and causing problems such as those at the Radley Lakes. Anyone minded to use this very useful by-product was required to jump through numerous hoops, in the form of a raft of permissions, which had to be acquired on a case-by-case basis – a very costly and time consuming process. This red-tape made it difficult for power companies to recycle spent fuel ash for other uses, while low landfill taxes offered little incentive to try. Since the campaign, as a result of the introduction of a protocol for the recycling of fuel ash, which SRL participated in formulating, much of the ash produced by coal-fired power stations, which hitherto had to be treated as waste and sent to landfill, became more readily available a useful by-product and is now more widely used, in the construction industry, for example.